The Barclays — … The Barclays What? The Barclays sets itself apart from most other tournaments by deciding to not use an identifier or other words in the tournament title besides the name of the sponsor. So I guess it’s neither an Open, nor a Championship, so probably just a Tournament. Actually, I’ll go with invitational since you have to qualify. So this week, it’s The Barclays Invitational. I asked Barclays officials about what kind of event this really is and they declined to comment. I’ve sat here for a while now trying to think of what to say about Barclays. I figured I needed to mention that you have to say “Barclays” with a English accent, cause 1) it sounds better, and 2) that’s a good enough reason on its own. But that’s about the only interesting thing about it. In reality, all you really need to know about Barclays is that it’s a British bank that does bank like things all around the world. Beginning in 1967 (and first won by Jack Nicklaus), The Barclays had a rich history of being played on the same course until 2008. The tournament was pretty much synonymous with Westchester Country Club, even donning the name “Westchester Classic” for the first 9 years of existence. 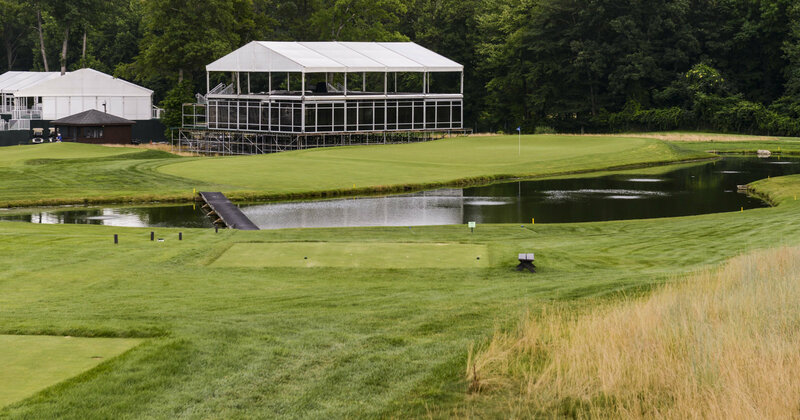 But money changes things, and in 2007 when the FedEx Cup began, the tournament was moved from June to August, and also started moving around host courses (and hasn’t returned to Westchester either). Currently, the tournament seems to be on a 5 course hosting rotation, with Plainfield being a part of it. How lucky are we, or I guess the players, since we get another Donald Ross course this week! And not only is it the second Ross course in two weeks, but it’s also the second course with ‘field’ in the name. Last week Sedgefield, this week Plainfield. Those people back in the day really needed to get more creative with their course names. Besides the 2011 Barclays and this year’s tournament, Plainfield Country Club had only hosted the 1978 US Amateur, the 1987 US Women’s Open, and that’s it! In fact, it has the most impressively small wikipedia page for any course on the PGA Tour. The thing tops out at a grand total of 4 sentences. It would be pretty interesting for there to be some sort of tool that can figure out the size of a wikipedia article and then rank all the courses on tour by their sizes. 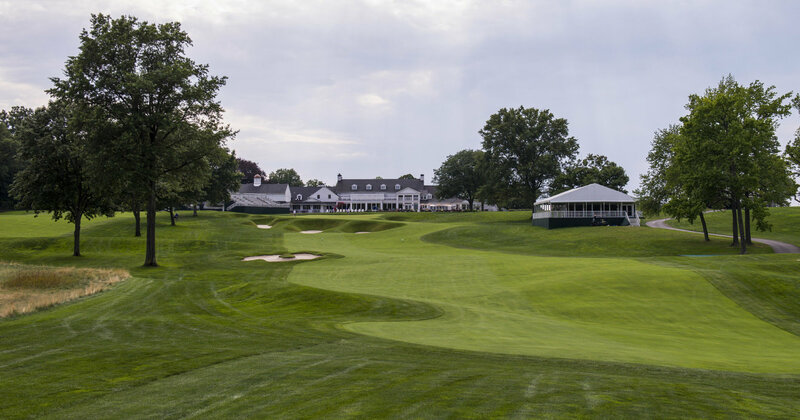 Without much background on the course, and only going by the pictures I’ve found on the internet, Plainfield looks anything but plain (terrible joke, I know, and I wouldn’t feel bad if you stopped reading here because of how awful it is). It’s a classic looking Ross course. Known widely for table top greens of Pinehurst, my favorite features of a Ross course look to be on full display at P-field. First is the slanted grouping of bunkers, often 20-30 yards in front of a green. Check out the 9th hole below, where you can see that grouping of bunkers. Kind of hard to get a depth on them, which also happens when you’re looking from the fairway. Tough to get your depth when bunkers aren’t in the “normal” spot in front of a green. Now the other feature I see at Ross courses is an impressive amount of square edges. Not talking about the tee boxes obviously, but fairways and green areas. The third hole here looks to be a good example of it, where even though offset, you’re looking at a triangle. Oh, and another Ross feature, present in both these pictures is native grass / fescue, often on courses you might not expect it. Check out the rest of the pictures from the set that I snagged the above from here, credit to Keyur Khamar of pgatour.com. 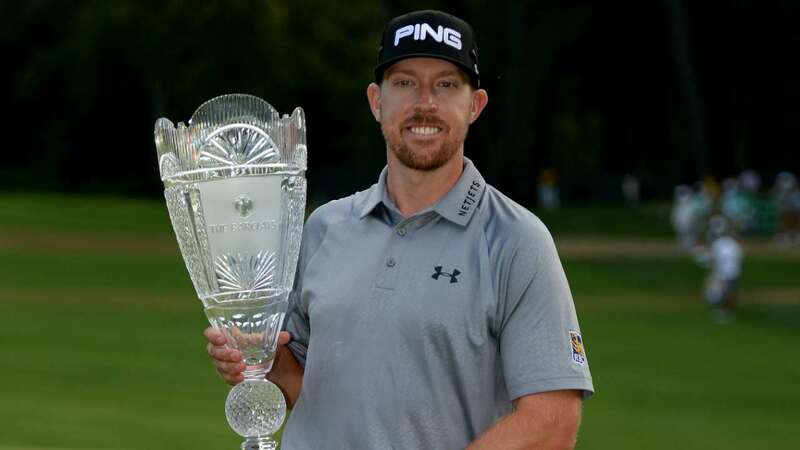 Hunter Mahan (remember him? I only kind of do) shot a final round -5 66 to erase a three shot deficit and end up winning by 2. Seems like he should be winning more than he does. Tees right next to greens — Cool thing about these old style country clubs that are built in cramped quarters is they’re really efficient at space management. Also a big fan of the fringe to teebox look itself. Check out this tweet from PGA Tour Media with a photo. Low ranked guys making moves — Definitely one of the fun things about the FedEx Cup is players playing way better than they’re used to in this 4 week stretch. Case in point is Billy Horschel last year winning the final two tournaments to jump from a starting rank of 69 all the way to 1st. Moves like that make the playoff system fun for sure. Low scores — DJ won here in 2010 when the tournament was hosted here the one previous time. He did so by shooting -19 in three rounds. And if you were wondering, the reason it was three rounds was because of Hurricane Irene.